A few pearls of cold, tense sweat rolled down my temples as the border with Honduras was left in my rearview mirror, the smell of fumigant still fresh in the air. 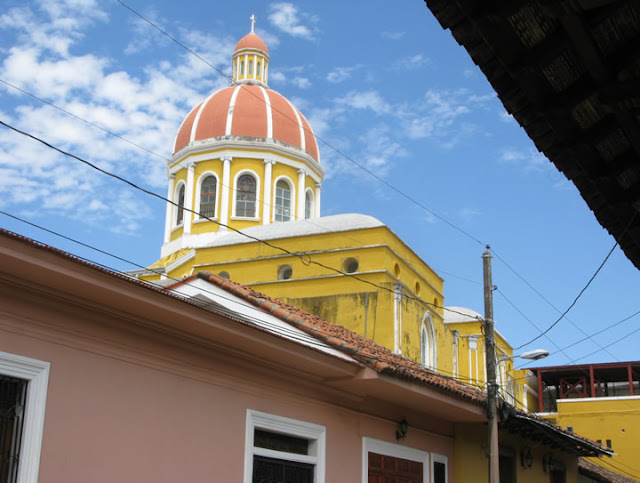 I had made it to Nicaragua, but still had about an hour’s journey to my destination, a charming little town named after my birthplace. 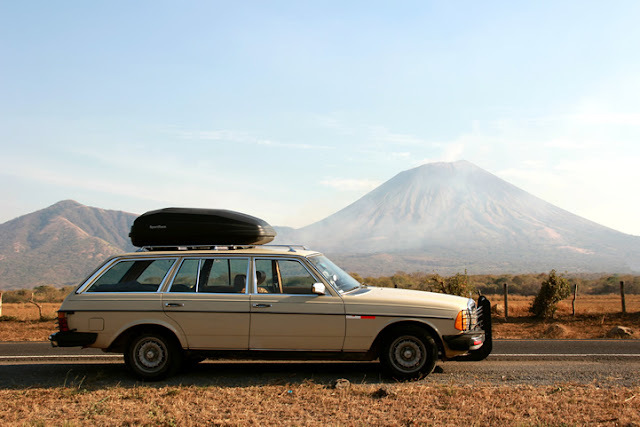 On this stretch of the PanAmerican the car glade over the smooth asphalt, passing many a cowboy on horseback, trucks laden with plantains, and landscapes that resemble part of the African savannah, with lush trees standing alone in the plains, and the majestic San Cristobal volcano towering in the distance. Sent this photo to Mercedes-Benz... they may make a small feature on the trip. 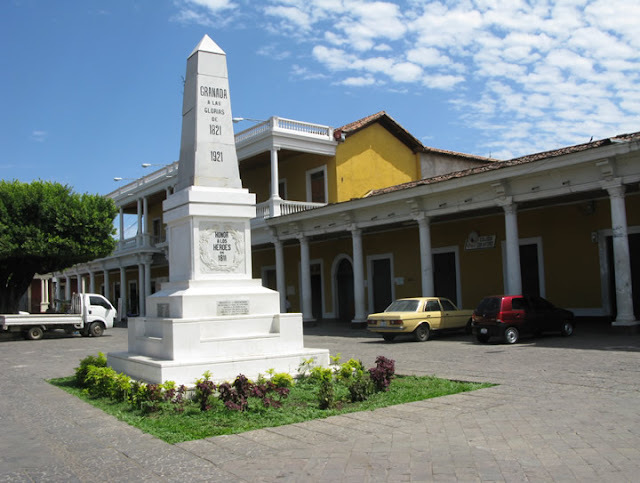 While the original town of León was founded by the infamous Conquistador Francisco Hernandez de Córdoba in the mid-1500’s, the current one –18 miles from its predecessor– is a calm, grid-shaped 19th Century settlement in the style of Mérida, in Mexico. 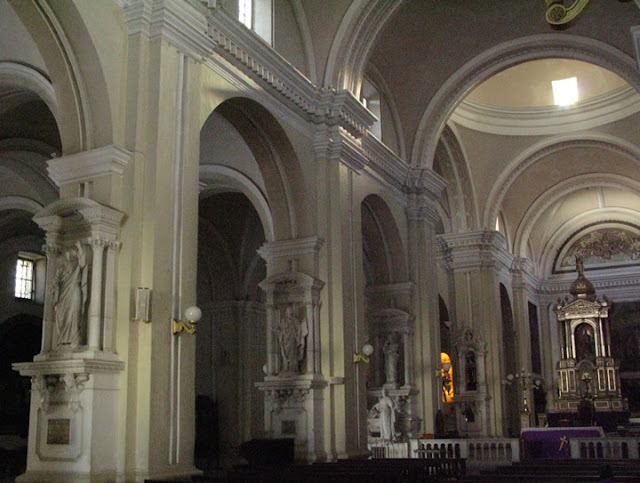 Its cathedral is a massive plaster basilica with minute details and orderly construction, a far cry from the usual Spanish Baroque in the Colonies. 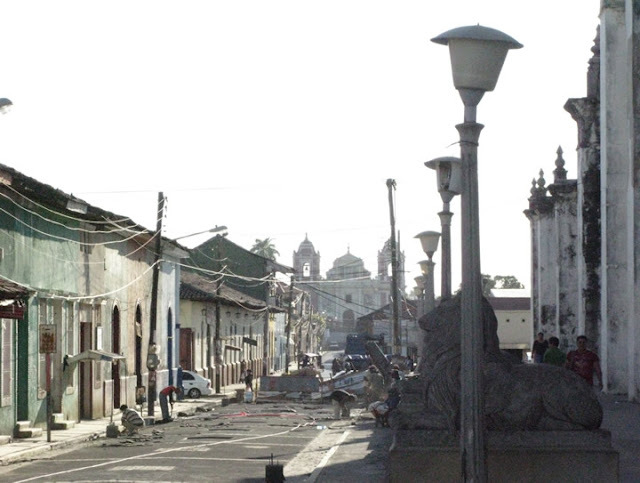 Right next to it is the town’s market, where $3 will buy a most delicious meal, often including Gallo Pinto (rice and beans) and grilled bananas. The town is a charm to walk in, and refreshingly safe compared to its northern neighbors. 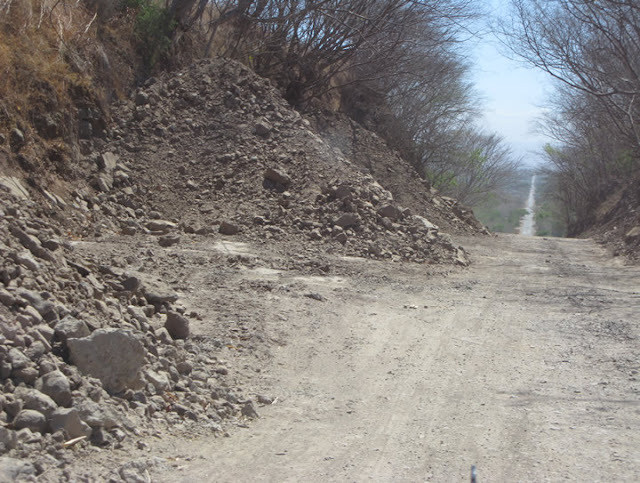 Getting out of it is a whole different story: in my stubbornness, I decided to stick to the original PanAmericana, and ended up driving over a minefield. Utter redundancy: a Leonese hits the streets of León! Much like in my original town, a religious seminar for the training of ministers. 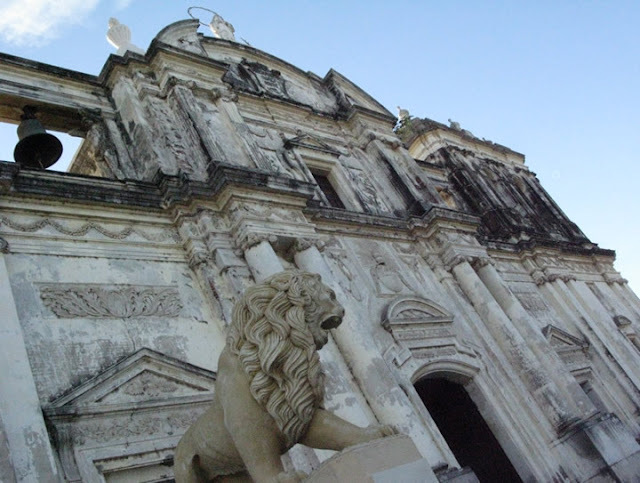 The Cathedral in question, built in the early 1800's. An interior resembling the Vatican more than any traditional colonial building. 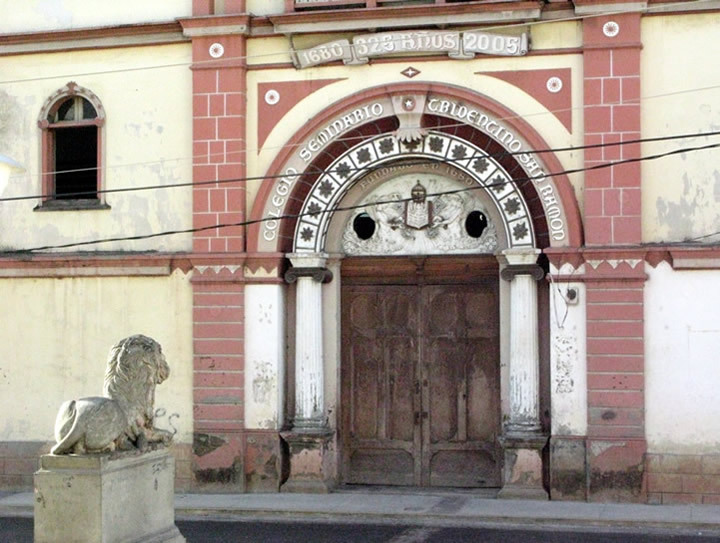 Said minefield led to León’s long-time rival: Granada, the country’s most touristic spot. Still, I managed to find two redeeming qualities in town: their main temple –a rare Spanish Renaissance church– and the best yogurt ice cream I have had in years. Moving on, I drove on to the town of Rivas to open a whole new chapter within this chapter: Ometepe Island. Where we are going, we don't need no roads! 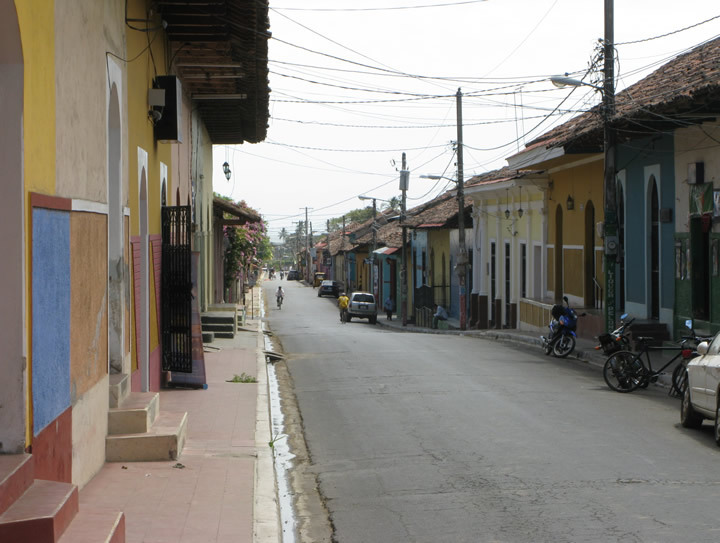 The colorful streets of Granada, much like Antigua Guatemala... but paved with asphalt. The Granada Cathedral, dating from the 1500's. Doesn't it remind you of the one in Florence? If you look closely enough, you will see why I took a photo of this monument. 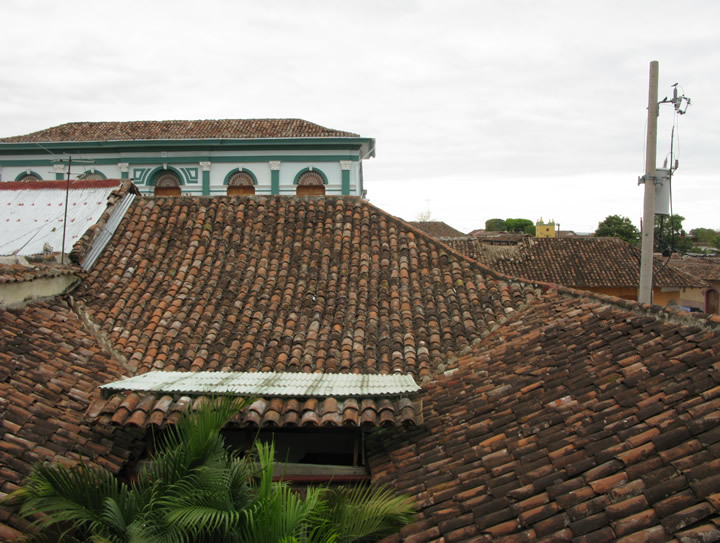 View from my room, a beautiful clay-tiled rooftop! 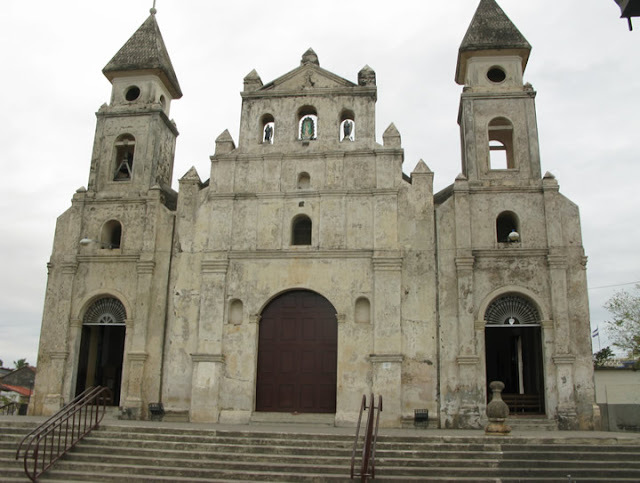 The Guadalupe Church was originally conceived as a fortified temple, hence its appearance. Ometepe is amazing. Actually, it is beyond amazing: it is Paradise, with a capital “P”. I had heard of the island via Life Remotely, but I could only wrap my head around its wonders by setting foot (and rubber) on its volcanic shores. 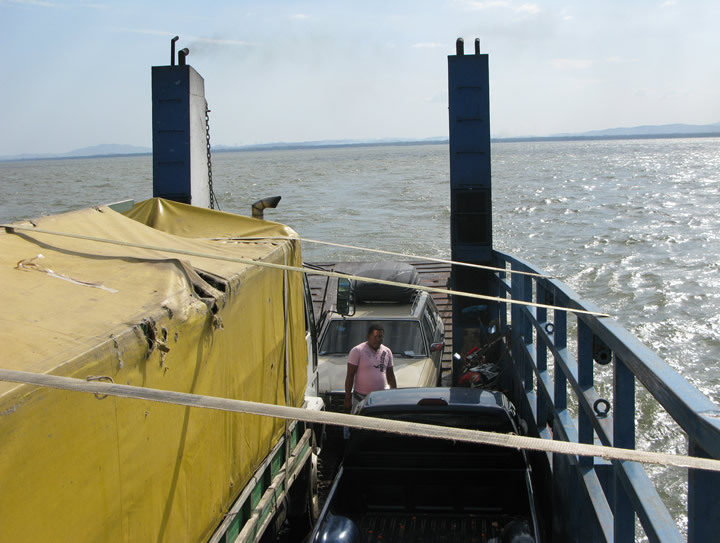 In the rickety ferry there I met a chap named Luke, who discouraged me from camping at Finca Magdalena, insisting on the steep grade of the ground. As an alternative, he suggested me to visit a place called Little Morgan’s, owned by a friendly Irish expat. Waiting for the ferry, I decided to take a nap in the back, overlooking the lake. Full speed ahead, Cap'n! 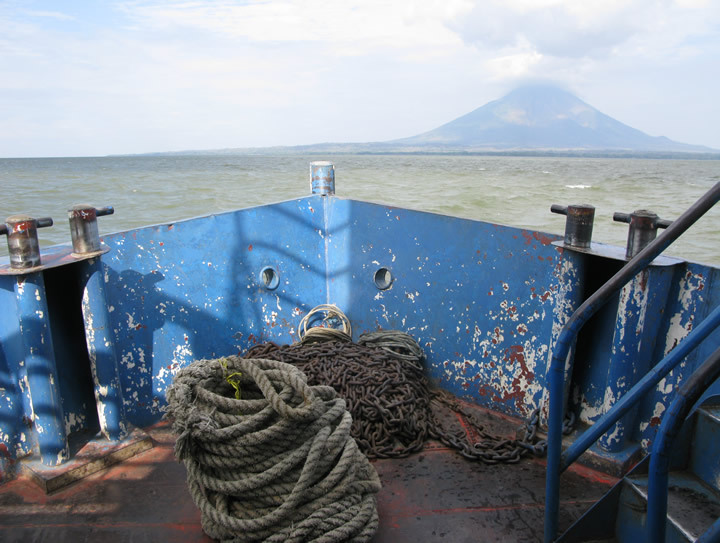 On to Ometepe! Definitively the first time that Livingstone rides a boat! Exciting or what? Livingstone the 300TD rolled down a narrow path on to a hut in the middle of the dense jungle, inching as slowly as the boat in Apocalyspe Now. As soon as the driveway ended, the ground became uneven, with plants crowding the wilderness and swarms of midges plaguing the air. Colonel Kurtz solemnly approached me, and shook my hand with assurance. He was holding a cold beer in his hand. I looked around me, and I was relieved not to see any chopped heads or body parts littering ancient Siamese temples, or any worshipping war photographers for that matter… Instead, I saw a neat complex of hand-built wooden huts, with a tall tower overlooking the rocky coast. I was in awe; then Morgan, without any of Colonel Kurtz’s stern tone, started talking: “Man, I love your car. 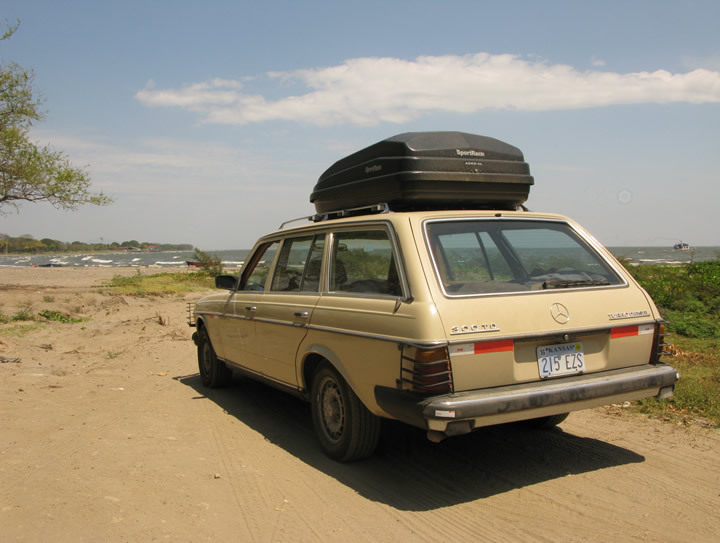 These Germans… when I traveled in the US, I bought a BMW 750iL for $1,800. F*cking eighteen-hundred bucks, man. I was awesome and f*cking fast. A BMW for EIGHTEEN-HUNDRED dollars”. I really did not know where I had ended up, but I was staring to like it. My camping spot at General Kurtz's headquarters. 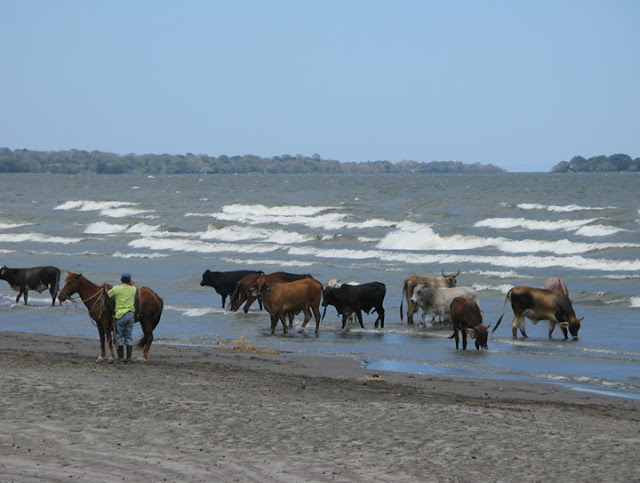 ...until a local shepherd took his cows to drink at the shoe of the lake. Magical! For the following week I resolved to do more exercise, given that driving is not all that physically taxing. I met another Irishman named Michael, and together we walked the entire length of the island. 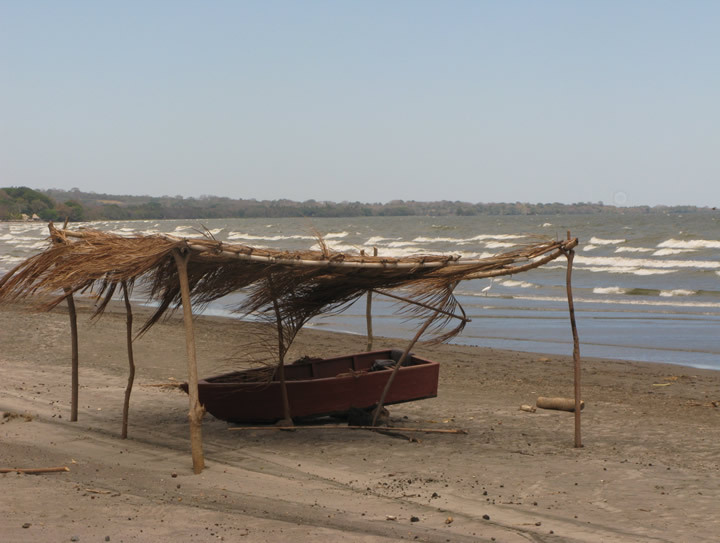 The next day I hiked to a nearby cape, stopping to talk to a shepherd who frowned on the new culture that the Gringos were introducing in the island. And I could not blame him, honestly: it is truly infuriating to see many of the island’s visitors make the effort of traveling to a whole new country, a whole new culture, to get what they get at home and let loose in their behavior. However, when I was not busy tearing my legs apart or quietly judging the scantily-clad Gringas and Hippie jugglers, I bathed in the volcanic waters with the locals, marveled at the feeling of having a beach entirely to myself and rediscovered the simple joy of well-cooked chicken and real bread. Such happiness cannot be put into words! The end of my stay arrived way too soon; but it arrived with the company of two Dutch ladies heading to Costa Rica. We sealed a deal in the warmth of wood oven pizza and amaranth tea in vintage Coca-Cola bottles: in exchange for my fuel costs, they would ride with me down to some hot springs in the North. For the next few days, adventure was served. Sounds like paradise Miguel ! . In Lago Atitlan in Guatemala , the nasty & dirty stoner hippes (American expats , all) embarrased me to no end .